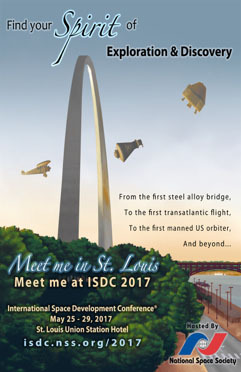 The mission of ISDC® 2017 is connecting knowledge seekers of all backgrounds in the spirit of Space exploration, development, and discovery. If you’ve never attended an ISDC®, always attend, or occasionally attend, the 36th annual ISDC® should not be missed! Meet me in St. Louis! Lewis and Clark began their journey to explore the West from St. Louis. The Eads Bridge in St. Louis was the first steel bridge across the Mississippi. Some business men in St. Louis funded the first nonstop flight across the Atlantic by Charles Lindbergh in his Spirit of St. Louis airplane. McDonnell Aircraft Company built the Mercury Spacecraft that took the first American, John Glenn, into orbit. Boeing in St. Louis has recently designed and built some flight simulators for its new Starliner Spacecraft.